Mrs. Meade and her brother Joe O'Brien with Members of the Museum Committee. We were delighted to welcome Joe O'Brien and his sister Mrs. Meade to the museum last week. They are the grandchildren of Captain Joseph Kavanagh (1853-1923). Kavanagh was appointed captain of the Fenian boat the Erin's Hope. 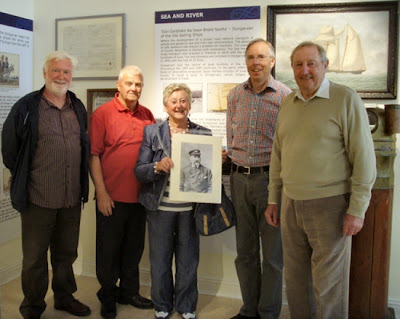 They presented the museum with a photograph of Captain Kavanagh and copies of his ship's master certs. We have an engraving of the Erin's Hope on display in the museum.